China’s big import fair this week hasn’t received the best press. President Xi’s commitment to import $45 trillion over the next fifteen years amounted to little more than a statistical expression of what China would be expected to import anyway—nothing new. And the whole exercise has the aroma of a still (somewhat) planned economy, now with a target for imports as well as a host of other targets (the new import goals sit uncomfortably with the targets for import substitution set out in what used to be called Made in China 2025). That said, I am not as cynical as most. I do think a Chinese campaign to raise its level of imports could be useful to easing trade tensions globally. In a comparative sense, China’s level of exports no longer stands out—at least not after adjusting for the imported content in Chinese exports (China, to its chagrin, still imports a lot of high-end chips from elsewhere in East Asia, particularly Taiwan and Korea). China’s economy was unusually export dependent—for a large economy—going into the global crisis. But its massive post-crisis stimulus reoriented its economy, and now China relies far more on an unusually high level of investment than on an unusually high level of exports. Rather what stands out is China’s relatively low level of manufactured imports. Net of “processing” (imports of components for re-export), China’s imports of manufactures are about 5 percent of its GDP. And this ratio fell significantly from 2003 to 2015—before rising a bit recently. The fall in the ratio of imports to GDP over time is a bit strange. A reasonable expectation is that—absent any rise in protection—imports of all kinds should rise more or less in line with GDP. But for China, over an extended period of time, that didn’t happen. Imports were growing more slowly than the overall economy. 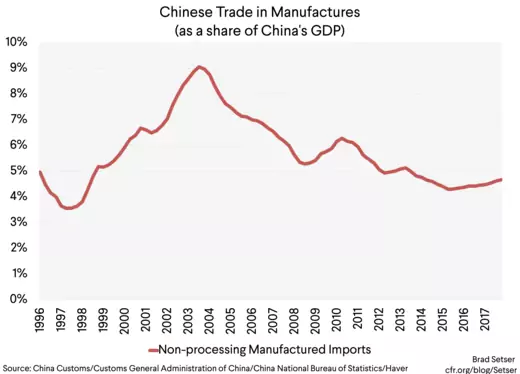 Partially because of substitution of “made in China” components for previously imported components, and partially because China met more and more of its own demand for capital goods domestically. The ECB had a very good paper on this a few years back. One way of thinking about China’s impact on global manufacturing trade is to compare China’s trade surplus in manufactures with its imports of manufactures (after netting out processing imports). 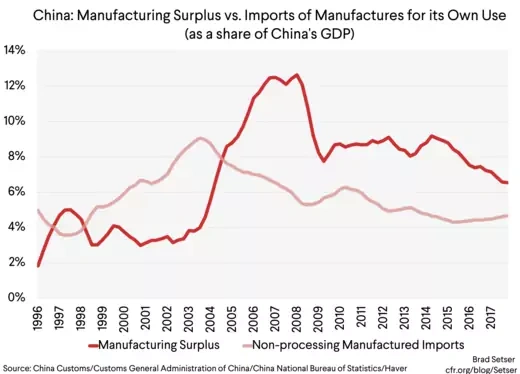 The China shock was marked by a big increase in China’s overall surplus in manufactures relative to its own GDP, a rise that pushed the size of China's export surplus in manufacturing well above my estimate of China’s own imports of manufactures for its domestic use. That remains the case today, though the gap has closed a bit (China’s surplus in manufactures continued to grow as a share of world GDP through 2015 by the way, it then stabilized at a high level in 16 and 17). 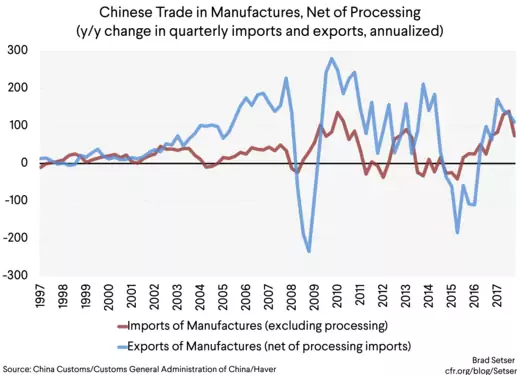 In the past couple of years China's imports and exports of manufactures have grown more or less in parallel, for reasons that I don't fully understand. The broad trend observed in China’s overall trade with the world also holds true for its trade in manufactures with the United States. A lot of U.S. exports to Hong Kong don’t stay in Hong Kong, so I added U.S. exports of manufactures to Hong Kong to U.S. exports of manufactures to China. 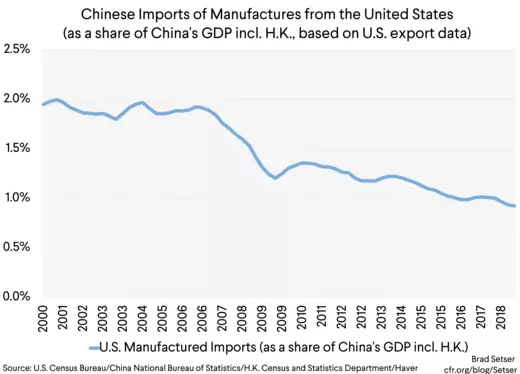 In aggregate, U.S. exports to China and Hong Kong have gone from around 2 percent of China's GDP to around 1 percent of China's GDP. And it is hard to see how China 2025 won’t cut that further. China 2025 is premised on using a mix of production subsidies and “buy China/buy Chinese” preferences to raise Chinese production in a host of sectors where China now imports. If it succeeds, almost by definition, it should further lower China’s imports of manufactures relative to China’s GDP. A bit of countervailing pressure to raise imports, particularly in high-end manufacturing sectors, might be helpful. I would even go so far as to suggest that a Chinese commitment to return its imports of manufactures (net of imported components) back to 6 or 7 percent of its GDP might be helpful. It would send a signal that imports are okay in an economy that isn’t entirely market based. Of course, it would be even more powerful if backed by concrete policy commitments to achieve that goal and address the suspicion that China 2025 aims to displace a lot of the advanced economies’ remaining exports to China. And I do think it is important to discuss imports, not “market access”—the old deal on China was always that to get access to the Chinese market, you had to produce in China (I differ a bit from James McGregor on this issue). Many U.S. firms don't really have a problem with the old deal, provided that they can get stronger commitments on the part of China to open more of its domestic economy to foreign competition together with assurances that firms won’t have to give up control of their technology to get access to the Chinese market. But allowing U.S. firms more access to the Chinese market so long as they produce in China wouldn’t directly address the concerns of U.S. workers that they aren't benefiting from China's rise. * These chips are often designed in the United States, but actual U.S. chip exports—$10 billion to China and Hong Kong—are small relative to China’s $200 billion in chip imports. The bulk of China’s imports come from fabs elsewhere in Asia (plus some chips made in U.S. fabs are shipped to Asia for assembly and testing).